Property Details: 4 Bedroom, 4.5 Bathroom Property with approx. 2942 square feet. 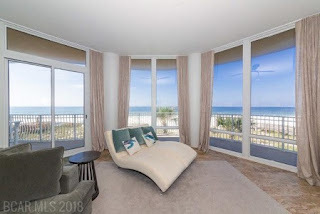 La Riva condo for sale in Perdido Key. La Riva is a Mediterranean inspired 3 tower luxury property built with the discerning owner in mind. With its elegant lobby, exquisite amenities, low density and 520' of gulf front you will find no details have been overlooked. Floor to Ceiling views of the gulf will greet you as you walk into this stylishly decorated beachfront residence. With almost 3000 sqft there is plenty of room for you and your guests. The 70' wide balconies make the gulf views feel like your private oasis- perfect for entertaining or quietly watching the waves roll in. Four bedrooms with 4.5 bathrooms, Private foyer entrance from elevator, 10' ceilings, fabulous master bedroom suite and modern kitchen complete this home. Each La Riva tower features its own indoor and outdoor pools, sauna, steam and exercise rooms, climate controlled storage,and private boardwalk to beachfront.